Fingers crossed that the gel remains a hit in the field (that is, inserted into her carrier during flight) — I would be really happy not to have to hold ice cubes in my hand, head pressed against the seat in front of me and arm stuck into Chloe’s carrier, for her to lick. Our next flight with her is in about a month, so I’ll hold off on posting this until we have a final report for you. Oops, wanted to add to comment above that this of course assumes no medical condition requiring the dog have access to water at all times. Left to their own devices, our own dogs drink once per day, about 2 hours after they eat, like clockwork. They may take a few laps one other time during the day, to taste, but not in any quantity that would suggest they NEEDED it. I am sure they could go 10+ hours without needing water in flight, and it’s been about that long since either of them has left their nest bed to go drink today. 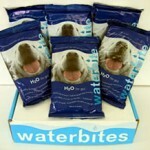 Can you tell me please WHERE can I purchase Waterbites? Alas, I can’t find them either, ME — I think this may be a product lost in the sands of time. Drat!! Please can someone tell me where can I buy the waterbite pouches for my dog?? Alas, Steve, I believe they’re no longer available anywhere — such a shame! Drat, Farook, it was discontinued awhile back. I yearn for someone else to start making it again, or something like it.